Light the barbecue, pack a picnic, invite friends for lunch, spend a bit of time preparing a salad with fresh veg from the garden and you’ll be fully appreciated. Here’s a feast for a summer day. Make up the marinade by whisking all the ingredients together or put them into a clean jam jar with a screw top and shake. Put the tuna steaks into a dish and pour over half the marinade. Give them enough room to get nicely coated, cover with cling film and chill in the fridge for a couple of hours, turning them over and covering with the marinade periodically. Use a ridged griddle pan on a hob or barbecue until hot enough to sear the tuna steaks for two to three minutes each side. 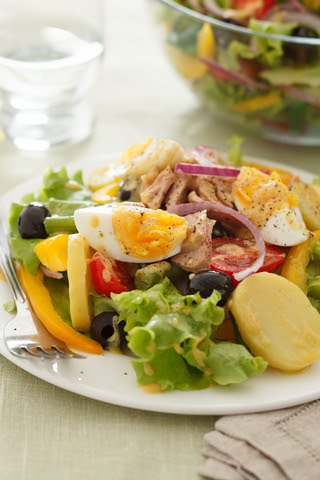 Assemble the salad on a large serving plate with the lettuce, anchovies, potato, onions, beans and tomatoes. Place the cooked tuna on top and add the eggs and olives. Tear the basil leaves and scatter over then drizzle on the rest of the marinade. Plenty for four with some crusty bread to mop up the marinade.